To enable credit and debit card transaction processing for your AbanteCart store, alongside a range of other payment options, you will need to enable one or more payment gateways in the AbanteCart administration dashboard. Stripe and PayPal are two popular service providers that have payment modules available for AbanteCart. However, a wide range of alternative gateways can also be integrated via third-party extensions. You can find out more about integrating PayPal payments in your AbanteCart store by reading this HostPapa knowledge base article: How to install the PayPal extension in AbanteCart. Read on to discover how to install and enable other gateway providers. 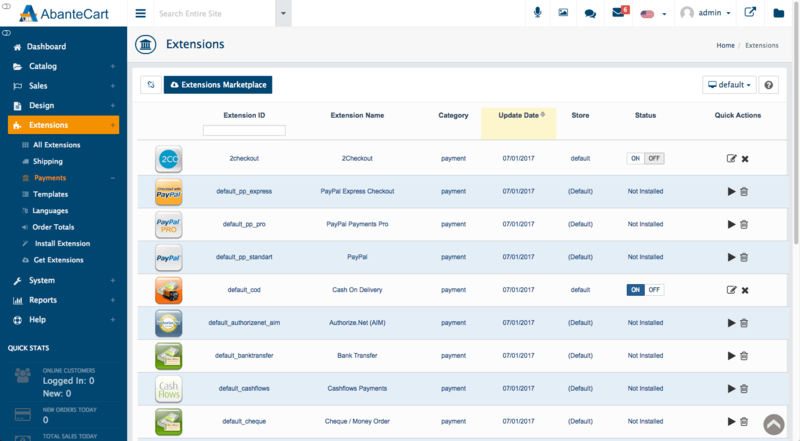 In the admin dashboard, head to Extensions > Payments, where you can review a list of modules supplied by AbanteCart’s developers. To install a module, click the Play button adjacent to the gateway you wish to select. To find out more about downloading and installing AbanteCart extensions, head to this HostPapa knowledge base document: How to install an AbanteCart extension.